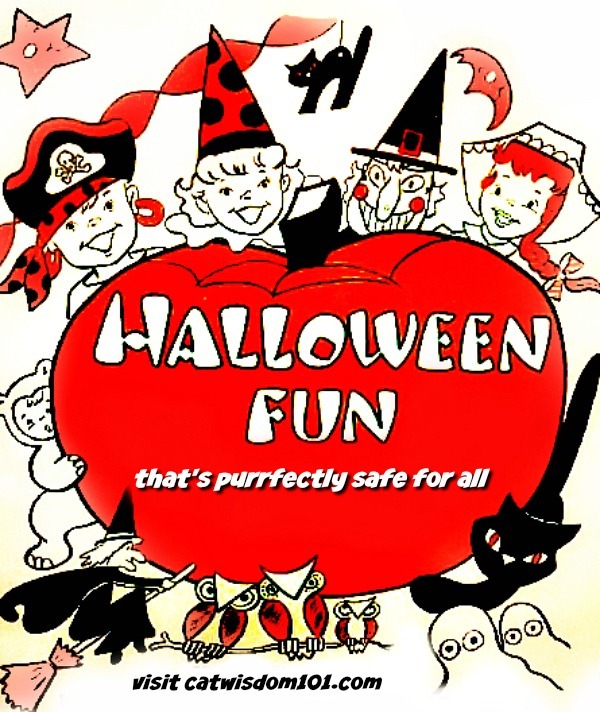 This is a holistic approach to Halloween Safety Tips from personal and professional experience. 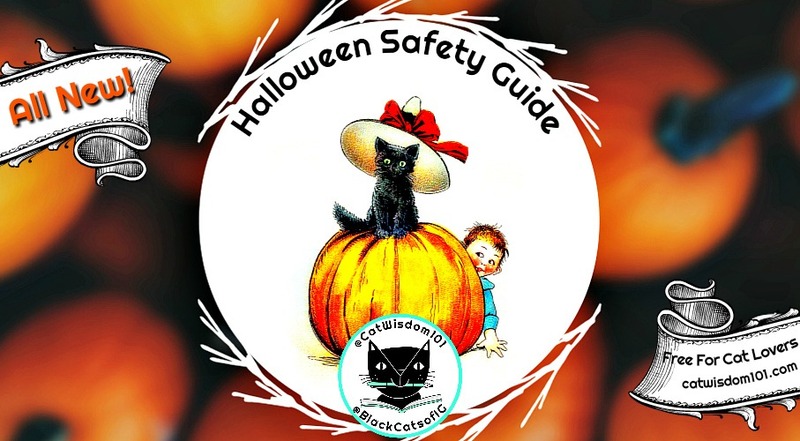 Halloween can be spooktacular fun for kids and adults but cats often don’t agree. Cats don’t understand the concept of a holiday but they watch for visual cues, changes in our mood and body language for clues that something different is afoot. The new sounds, party decor, costumes, make-up and smells adds up to excitement and anticipation rivaling Christmas and cats pick up on every nuance. Their senses are also far more acute than ours so what is loud or stimulating to you, may be very loud and over-stimulating to your cat. Every year Halloween grows in popularity and this year will break all records for holiday spending. Cats have zero interest in shopping unless we’re buying treats or something they love. What they love and what the Halloween crazed shopper loves could be very different. Cats, being innately curious, use their finely attuned sense of hearing and smell to sniff out what’s new or different which can translate into fear or anxiety. The holiday season now stretches from Halloween, Black Friday, Thanksgiving to Christmas and the New Year. That’s a lot of shopping, preparing, travelling, entertaining and mixed into the fun is stress and anxiety. This year, I invite you to think like a cat. It will make both of you happier and less stressed. Make cats a part of your self-care. They are powerfully calming to meditate with even if they aren’t lap cats. By spending more me time with the, you’ll notice if something is amiss sooner. Anticipate what they might do or how they may react and prepare in advance. It’s always better to be safe than sorry. We may revel in the joy of holiday celebrations but cats prefer a same old, same old routine. 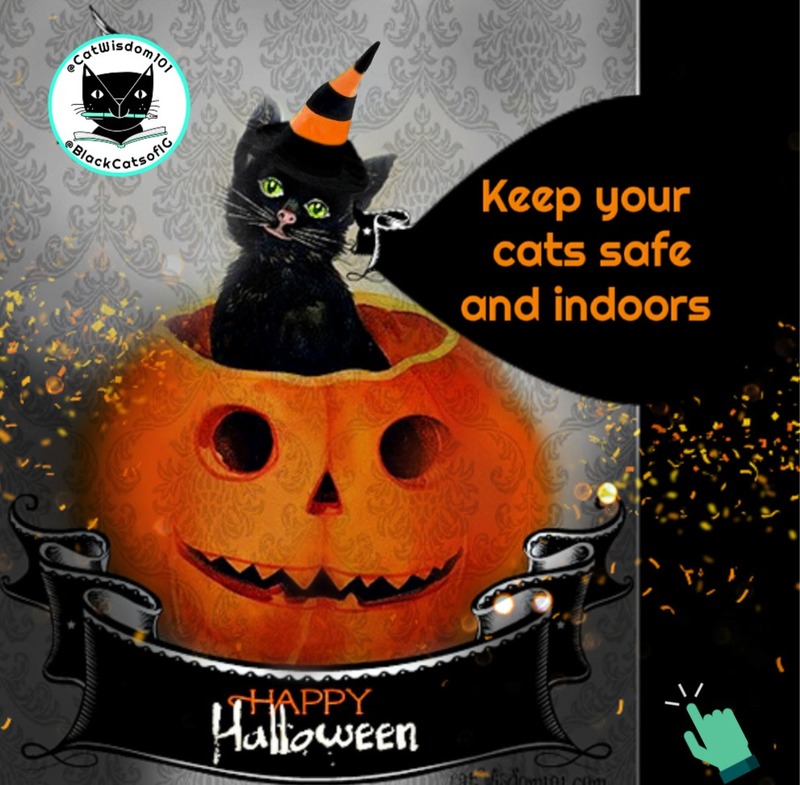 If your home is party central with doorbells ringing and spooky music blaring, strangers in strange costumes invading your cat’s territory, children shouting “Trick or Treat!”or increased traffic sounds is every cat’s nightmare. Create a quiet, cozy hideaway where they can retreat. Ideally in a separate room where you can close the door. Place a “do not disturb” sign on the outside of the door to keep guests out. Move your cats’ favorite bed or cushions, arrange places to hide and perch, place water and food bowls and litter. Close the curtains to hide any scary lights or movement. A couple days before the event, plug in a calming pheromone like Feliway. Communicate with your cats before the action starts; tell them it’s just fun and reassure them everything will be back to normal the next day. If you can’t sequester your cats, make sure indoor/outdoor cats remain indoors. Many years ago, a friend of mine let her two cats out on Halloween. One returned but her black cat never did. It still haunts her. It’s always easier to be safe than sorry. Superstitions about cats especially black ones sadly continue, as does cruelty. Even the calmest or sociable cat can behave out of character with unusual stimuli. Indoor only cats may want to slip out the door. Just in case, have all pets wear a collar with ID even if they are micro-chipped. Regardless of what color your cats are, keep them in that day. Make sure they get enough exercise and interactive play first. Two of our cats are indoor/outdoor who always come in before dusk and two are indoor only. I’m finding as the days get shorter, Odin and Domino want to stay out past dusk which is a cat’s prime hunting time. Americans will spend a record 350 million on Halloween costumes for their pets this year. Since popularity for costumes is growing, let’s hope awareness of cat behavior grows with it. Yes, there are hoards of cats wearing costumes on Instagram and some of them clearly love it. Others tolerate and then there are the miserable looking ones. The truth is: most cats don’t like being dressed in anything other than their purrfect fur coat. If you can’t resist the urge to play dress up at least respect your cats’ limits. Never force your cat to wear a costume. If you do, don’t be surprised if they retaliate in unpleasant ways like peeing out of the box. If your cat doesn’t mind dressing up, make sure the costume fits comfortably and safely. Never leave a cat in costume unsupervised. 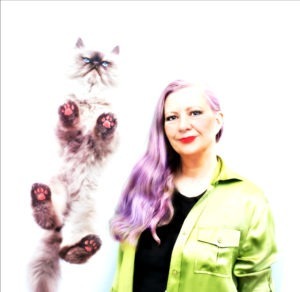 Keep it on briefly (for a photo-op) and keep kitty within sight in case of “wardrobe malfunctions”. Here’s a scary thought: loose threads, ribbons or feathers can be ingested causing intestinal obstructions. An emergency visit to vet costing thousands is an even scarier thought. Some fabrics are flammable and some costumes are choking or strangulation hazards. Avoid costumes that restrict movement or those silly wigs or hats that squish or cover the ears (they need their ears free to navigate within their environment). If you must because it is so cute, do a quick selfie or a few shoots. An easy festive fix would be a colorful collar or bowtie. 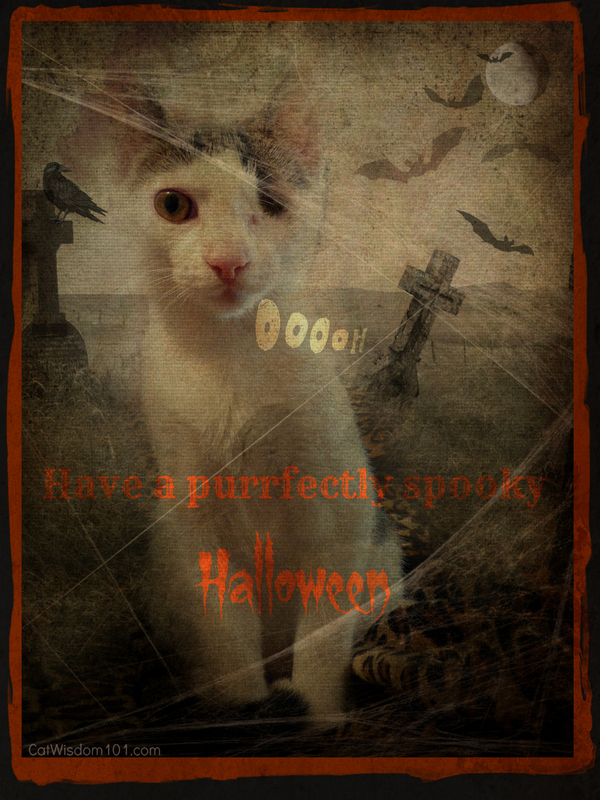 The safest option is to photo edit your cat wearing a costume or other ghoulish fun. Our Odin (pictured below) prefer to be au naturel and photo edited. Halloween candy, bowls of snacks, treats with crinkly wrappers can be tempting. Cats don’t have the gene to taste sweet and can get sick or choke from snacking on chocolate or other toxic treats like alcohol. Give your cats their own healthy kitty treats. A little plain cooked pumpkin is healthy for cats but raw pumpkins or blazing jack-o-lanterns are not. Tell your guests not to feed your cats any human treats or beverages but keep an eye out. Note: drinking in excess tends to loosen common sense and healthy boundaries. 4) Catnip Toys NOT Cobwebs. Halloween decorations are ghoulish delights but can be noisy, scary and potentially deadly for cats. 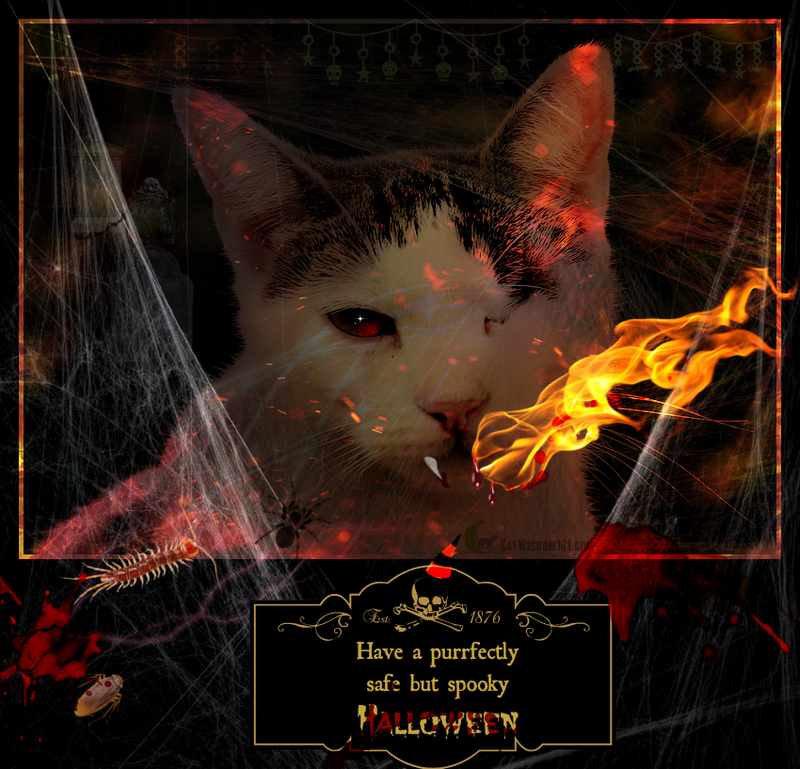 Cats being curious are attracted to Halloween decorations, costumes, shiny foil, stringy cobwebs, spooky electric lights. They aren’t decor to them but potential prey/toys. Make or buy Halloween themed catnip toys instead. 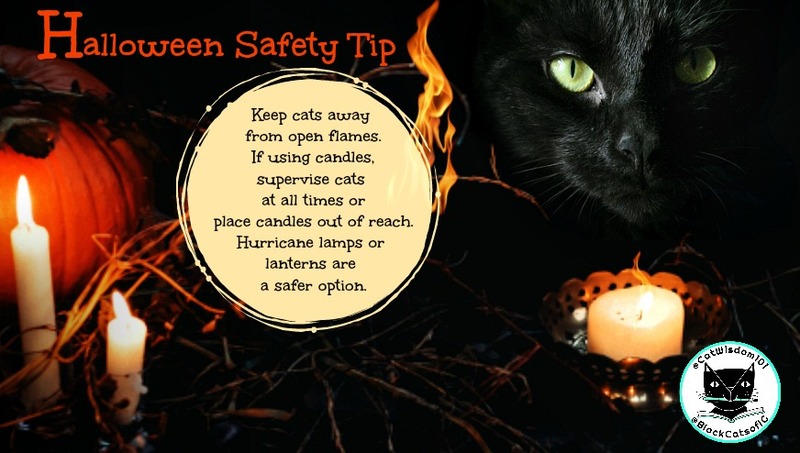 Keep all candles away from cats to avoid singed fur, whiskers or worse. I confess to loving real candles and not electric or battery operated candles. Again it’s all about common sense. Pillars are safer than tapered candles in candlesticks and tiny votives are lovely high up on a shelf. Just make just it’s not the cat’s superhighway. 5) Who is that Masked Stranger? Did you know that simply wearing scary make-up or a mask, it may confuse or spook your cat? The videos we think are funny by someone scaring their cats has a dark side. Our cats recognize us by using all their senses including smell. Wearing a latex, rubber or plastic mask or heavy make-up not only changes our appearance drastically but it changes how we smell. If your cat is spooked, crouch down, approach slowly, speak softly and extend a familiar smelling object like or eyeglasses or finger. Allow them to smell it to establish the connection. Tell them, “It’s just your crazy cat mom or dad being silly and not a masked stranger. Happy Halloween! May yours be purrfectly delightful and not frightful for you and your cat(s)! How has Black Cat Awareness Month been for you so far? Learn anything new? 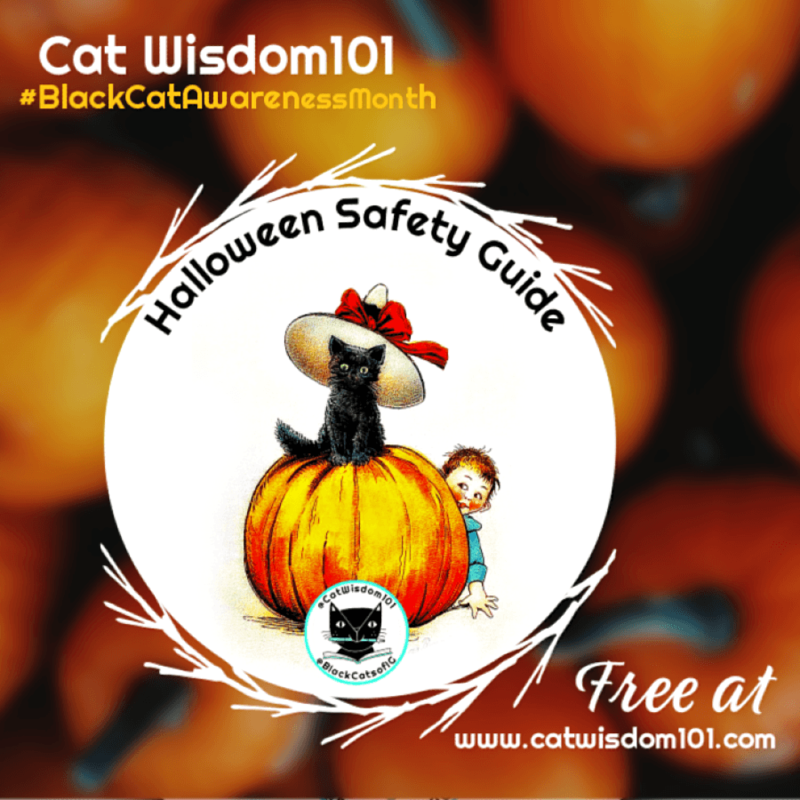 Very good advice – it can’t be said enough, keep cats inside, especially black ones around Halloween! Happy Black Cat Day! Great tips and thoughts about this way to scary time. Somehow Pipo & Dalton are glad that this den doesn’t ‘do’ Halloween…well, at least not the trick or treat stuff or scary things. The peeps here think it is not in line with their way of life. I’m curious if you believe Halloween is anti-Christian? The holiday is so secular in the way Christmas has become that other religions celebrate some of the customs. Ironically, all the Judeo-Christian holiday have Pagan roots dating back thousands of years. A fascinating history to explore. Great tips & advice. Honestly days before and on the day of evening/night) I will stand outside shivering keep a watchful eye over the ferals in particular the black ones which we have always had around. Oh there is a ‘new’ black cat- so very feral and impossible almost to catch. Another very old Tom who I found quite by accident inhabiting the garden shed. Hoping by spring or before he understands these humans mean no harm. another battle scarred boy. Very not imaginative name…….. hubby calls him melonhead e was so hungry he hung across the street when first noticed and was eating a neighbor’s melons. We shall come up with a more dignified name. I hope your Halloween is a safe and calm one. I also hope you and the cats are as healthy as can be. Great tips here for our sensitive furry friends. 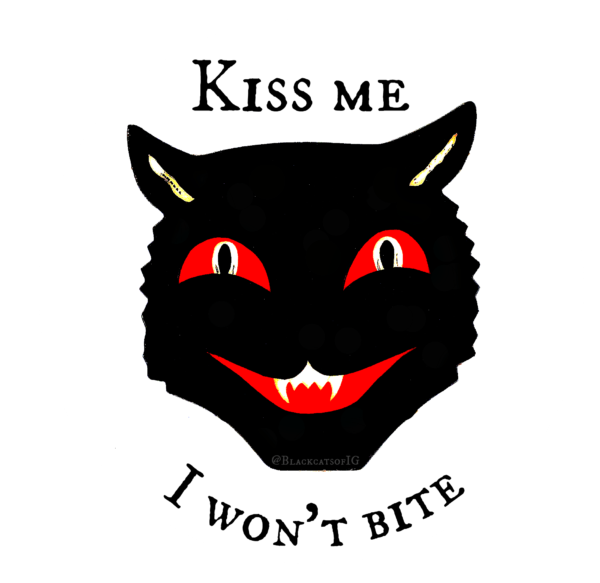 Our neighbour’s black kitty, Cachou, is always out even on Halloween and I’m always so worried for her. I hope all the kitties stay safe! Please tell your neighbor to keep Cachou inside or share this article. Great tips! We passed most but the costumes . . . but in fairness we who did dress up don’t mind them too much and only the kitties who don’t mind pawticipate. Happy Halloween to you all! Great tips! We will share them on twitter right now. Excellent post. Our boys have Halloween colors (Mao = black/white and Cheddar = orange) but we don’t let them go out. And, we’ve stopped doing Halloween, for a few years, anyway. Our kids are grown and out of the house, so we’re taking a break until we get grandkids, in about a dozen years. 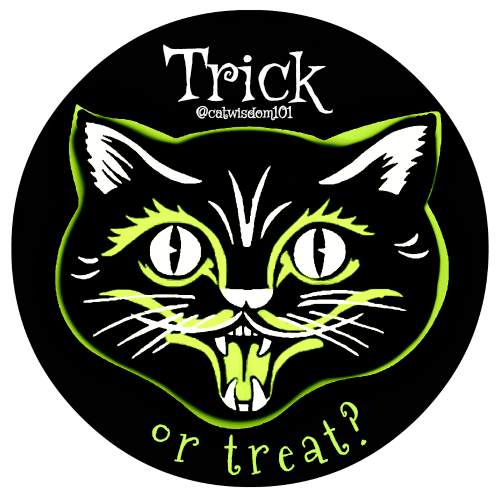 Wonderful reminders…..kids find Halloween such fun but cats who are outdoors are at risk……………….Sammy will be watching the trick or treaters from INSIDE as always…….Love the photos!!! I love these! I shared them on Facebook. Good advice. We don’t really celebrate Halloween here, and we are too far out for Trick or Treaters which I am sure Flynn is glad about. Those were good! I’m just happy when the doorbell quiets down! Wise advice! Mum will be keeping me in! FYI this one did not come in my mail. You might have an issue again.